Welcome to the Winslow History website. 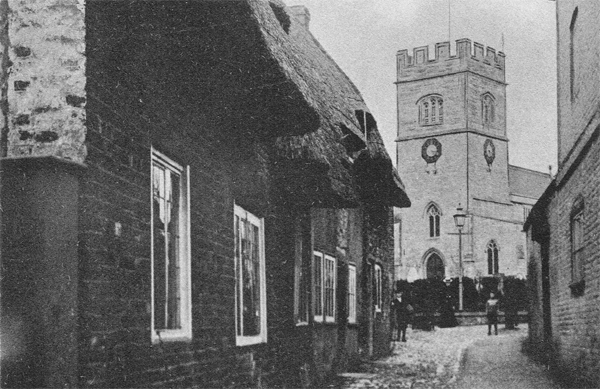 On this site you will find photographs, transcribed documents and short articles about the history of Winslow, Buckinghamshire, from the Anglo-Saxon period to the 20th century. Please scroll down for an introduction to the town's history, and use the menu on the left to navigate around the site. There is also a search engine at the foot of the page. This postcard was posted in 1907, and the photo was taken from outside what is now nos.61-63 (Unique Pets and Heritage's). This end of the High Street was still sometimes known as Buckingham Road. On the right is the Post Office in the shop previously run by the Loffler brothers. The two buildings to the left of it are still there, but beyond that is the Chandos Arms, destroyed in the 1943 plane crash, and the site which is now the end of Elmfields Gate. On the left, the telephone pole stands immediately in front of the end of 73 High Street, and the front gardens of numbers 65-71 are visible. This was the site of the gasworks 1843-1880, and the building on the left edge of the photo could have been the manager's house. It was demolished soon after the photo was taken and replaced by no.63 (Heritage's). No.61 and the adjacent purpose-built Post Office were added in 1911. The Morecrafts were butchers in Winslow for over a century, starting with Thomas Morecraft who arrived from Swanbourne in 1742. They acquired property in Church Street (now numbers 4-12), and also had a shop at 12 High Street (later Ingram's butchers, now Mercy in Action). Ann was the granddaughter of the first Thomas. She inherited 10-12 Church Street (Old Homestead / Abbot's House) from the Morecrafts and land called Crocketts Close (roughly from where the Fire Station is now to 81 High Street) from an aunt. She was a comfortably-off Winslow spinster until at the age of 62 she got married to Henry Fountain, a butcher of Newgate Market in London. They probably met when Ann's niece married Henry's son. Henry seems to have been fairly wealthy in his own right but they drew up a marriage settlement to protect Ann's property, which otherwise would have been under his control. They retired to Watford, where he began styling himself "gentleman". He died in 1825 leaving Ann their bed, his silver teapot and an income of £40 a year. She was a widow for 11 years and may have returned to Winslow, where she was buried. She left most of her property to her nephew John Morecraft, another Winslow butcher. Read more. Winslow is an ancient royal manor, situated mid-way between Aylesbury and Buckingham. It was too near to either of these towns to have become a major commercial centre, but it was large enough to attract the agricultural surplus of the neighbouring villages. In 792, King Offa of Mercia gave Winslow, along with the villages of Granborough and Little Horwood, as an endowment for his new abbey at St Albans. An Anglo-Saxon charter, giving the original boundaries of the manor of Winslow, was recently discovered in the Royal Library in Brussels. The hamlet of Shipton was also part of the manor, with its own field system. The principal road through Winslow ran east to west, along Sheep Street and Horn Street, whose names evoke the smell of livestock sales. The Abbot of St Albans secured a market charter for Winslow in 1235 and carved out a market place from Horn Street and the Churchyard. At the same time, a new High Street was laid out, running north from the Market Square towards Buckingham. Here the shops were built on rectangular plots running back to a rear access road, later to be known as Greyhound Lane. The Abbot of St Albans built a tithe barn in Horn Street, but the present building dates from about 1700. The Abbot also had a grange at Biggin, by the stream which divides Winslow and Granborough. This was where St Albans representatives stayed when they visited Winslow, and it was a substantial farmhouse in the 16th century, but little now remains except some earthworks. When the abbey was dissolved in 1539, the manor of Winslow passed to the Crown, and was eventually sold to Sir John Fortescue of Salden. Winslow's oldest surviving building is St Laurence Church, parts of which date from the 13th century. The church was much altered by Victorian restoration, but some medieval features survive, including wall-paintings. Because Winslow belonged to a major abbey, it is very well documented. Detailed court books survive from the 1320s and include the names of those who died in the Black Death in 1348-9. Wills are another important source of information. From the same court rolls, it is clear that Winslow, and the separate hamlet of Shipton, were cultivated according to the 'open-field' system, where each farmer had a number of strips dispersed in three common arable fields. The enclosure of the open fields of Shipton in 1745 and Winslow in 1767 meant that all the land which the farmers had cultivated in common was reallocated, and quick-set hedges were laid around the new allotments. The enclosure also led to the diversion of several old roads. Verney Road replaced Western Lane as the main road to Addington and the road from Swanbourne to Buckingham, which had bypassed the town, was blocked in order to divert traffic through the Market Square. Furze Lane was created in order to give access to several small allotments of land to the west of the town. Farmhouses were built outside the town for the first time. Most of the arable land was turned into pasture, and the windmill ceased to function. Winslow has a strong nonconformist tradition going back to the 17th century. 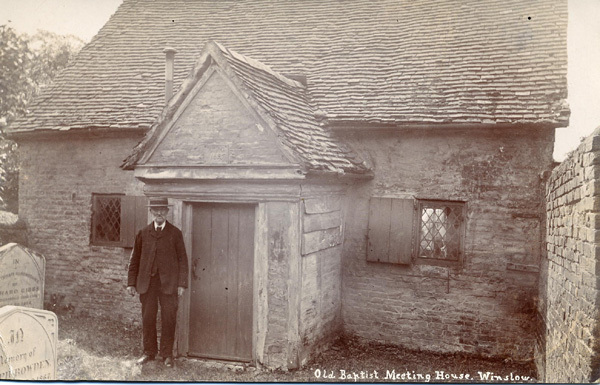 The Baptist chapel now known as Keach's Meeting House was built in 1695, and is one of the oldest such buildings in Bucks, named after the Baptist preacher Benjamin Keach who was persecuted in the 1660s. A Congregational Church (now a private house) and Baptist Tabernacle were build in the 19th century, and the Salvation Army flourished briefly. The first endowed school was the Rogers Free School, set up by a will of 1722. The old coach road from Aylesbury, which followed a Roman road from Quarrendon to Granborough and then headed for Buckingham via East Claydon, was diverted through Whitchurch and Winslow by the turnpike before 1745. This gave a boost to trade in the town, where the Banbury coach stopped at the Bell Inn (the foremost of the numerous pubs) or the Three Pigeons. Winslow was not a significant market, but it was the home of a number of wealthy professional men serving the gentry of the surrounding villages. During the 18th century, there were two or three doctors, several attorneys and more than one surveyor, all of them occupying large houses near to Market Square, as shown in a directory of 1798. There are also extensive fire insurance records from this period. Winslow was the birthplace of William Lowndes (1652-1722), Secretary of the Treasury under William and Mary. His story is a piece of remarkable social mobility: as a son of an indebted farming and innkeeping family, he was sent off to London, where his work as a civil servant and four marriages provided him with a fortune which enabled him to buy the lordship of the manor and much of the land. Before 1700, Lowndes bought several farmhouses in Sheep Street and demolished them all to provide a site for a new country house. Winslow Hall was designed for Lowndes with help from Sir Christopher Wren. It was built to the highest standards by craftsmen used to building fine houses and public buildings in London. The Lowndes family (who moved to Whaddon Hall and added the name Selby) sold the Hall and estate (over half the parish) in 1897 but remained lords of the manor until the early 1900s. Redfield, a Victorian villa, was also built for the Selby Lowndes family but was later sold to the Lambtons. In 1834, the Poor Law Amendment Act brought about the sale of village poorhouses and their replacement by Union Workhouses in the larger towns. Winslow became the centre of a Union and a grim new Workhouse serving the town and neighbouring villages was built on Buckingham Road. A Board of Guardians was elected to run the Workhouse and the Rural Sanitary Authority was formed in 1872 as a sub-committee. The Sanitary Authority was replaced in 1894 by a Rural District Council, whose main legacy was the building of solid new houses to rent at Western Lane, Tinkers End, Demoram Close, Burleys Road, Missenden Road and Verney Road. These houses date from the 1920s to the 1950s when successive governments gave subsidies to local authorities to provide for general housing need and those displaced by slum clearance. Over 50 men from Winslow were killed in the First World War, and most of them came from families who had lived in low-quality housing, hence the "homes fit for heroes" slogan. The northern part of Winslow developed in the Victorian period with the building of the Workhouse in 1838 and the laying out of Station Road to the railway station in 1850. The railway brought no industry to the town (although small-scale industrial activities such as tanning continued), but it did provide a route to London for local dairy products. 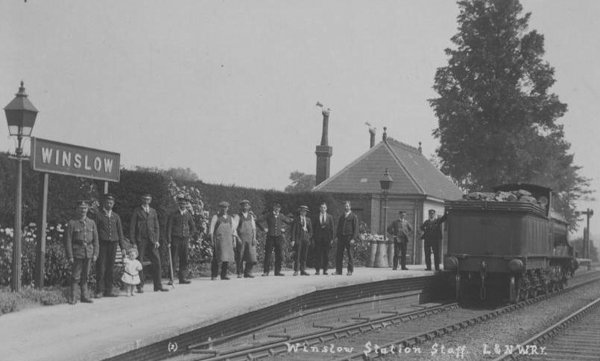 The railway also made Winslow accessible to the London sporting fraternity, several of whom kept 'hunting boxes' in the town. Winslow estate agents always described the larger houses as close to the railway station and convenient for the meets of the Whaddon Chase, Bicester and Duke of Grafton's Foxhounds. Many photographs of Winslow from the late 19th and early 20th centuries have survived (a lot of them by Winslow's own photographer J.H. Turnham). The town's population rose from 1,100 at the beginning of the 19th century to 1,890 in 1861 (see the full transcription of the 1841 census), but then declined to 1,500 by the Second World War. 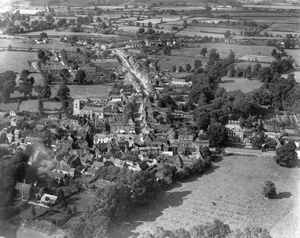 An airfield was built at nearby Little Horwood during the war and 13 residents lost their lives in 1943 when a Wellington bomber crashed on the High Street. The railway station was closed to passengers in 1968 and the line was reduced to a single track in 1985 but is expected to reopen in the early 2020s. 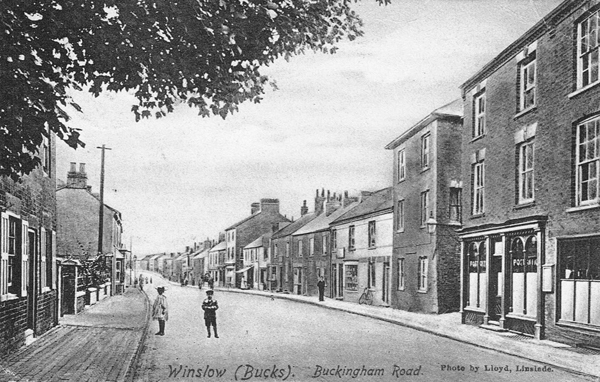 After the Second World War, the growth of private car ownership made small towns like Winslow attractive to commuters. The Elmfields Estate on the north side of the Aylesbury road was developed in the 1960s by the Metropolitan Railway Country Estates Company. The 1967 Winslow Plan set a population target of 5,000 and led to the development of the Magpie Farm Estate to the north-east of the town. The houses and a new primary school were built beyond the line of a bypass, originally proposed by the County Council in 1935, but abandoned in the 1990s. Despite proposals to re-open the railway line to Milton Keynes and Oxford, the former railway station was developed for housing, also in the 1990s. A site for a new station has been allocated to the west of the Buckingham Road, where the land was designated as public open space under the 1967 plan. The full text of Arthur Clear: A Thousand Years of Winslow Life (1888) can be read on this website. We have a full list of Winslow road names and their origins. You can search for people on this website by using the index of names. If you are looking for someone specific, you are recommended to use the search engine below as well.